One of the biggest risks to our oceans is offshore drilling. Oil spills can be devastating for the environment and the coastal industry where the spill took place. Learning from the latest BP oil spill, Clear Currents is diligently working on the final touches for a solution that eats away spilled oil and creates oxygen as a byproduct. This solution would be poured into the water, is eco-friendly for the environment and would eliminate the oil. We hope we will never have to use this new product, but in the event we do, we think we can make a clean up a whole lot safer and easier to manage. Our products are so safe we sometimes find out about additional benefits we didn't plan on. Our agricultural products are made from sea kelp, which happens to be the highest source of nutrients on the planet. We noticed that the livestock eating the plants were gaining a lot of weight and becoming very healthy. Lately, we have been looking at the possibility of making feed, nutrients, and vitamins for various types of livestock. The improved quality of food will make a happier, healthier animal, and provide more of what we need. Though it seems obvious that different plants have different nutritional needs, most commercially available products take a one-size-fits-all approach. Clear Currents is dedicated to the best-possible solution when it comes to making products that help agriculture and help the environment. Clear Currents will be releasing a line of products for specific plants and soil types. By doing this, Clear Currents can make farming more efficient, less expensive, and help heal soil in soil-damaged farming areas. Clear Currents is making the environment better for all, and helping move toward a world where hunger does not have to be a problem. 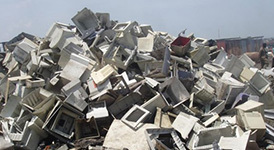 Only around 10-20% of the electronic waste is recycled, while the rest is dumped carelessly.